If you are looking for information on the Growing Roots franchise business opportunity, Growing Roots franchises or Growing Roots franchising, then you have come to the right place. Growing Roots sells, leases, designs, installs and maintains a vast selection of beautiful indoor foliage for homes, offices, lobbies, banks, restaurants, hotels, medical facilities or anywhere in between. Growing Roots™ brings the outdoors in. Freedom of Owning Your Own Home-Based Business! interior plantscaping and maintenance franchise. A home-based business model - No storefront or office space is required. Low-overhead - Our home-based business model keeps your overhead down. 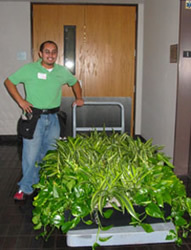 Year-round demand - Unlike the landscaping business, indoor plantscaping is not seasonal, it's a year-round business. Low to no inventory- Depending on your location, no inventory is needed. You can order products as needed from suppliers and pick them up and deliver them to clients. Potential recurring revenue streams from monthly maintenance service accounts. Growth potential- You determine how big or small you want to grow your business. Flexibility- You'll have the freedom to create your own schedule. Eco-Friendly - Services that contribute to a green environment - The services that your business will provide help clean indoor air. 6 months ROYALTY FREE - Gets your business off to a more profitable start. With Growing Roots you'll own a business that counts every building and home as a potential customer. Growing Roots sells, leases, designs, installs and maintains a vast selection of beautiful indoor plants for homes, offices, lobbies and common areas, banks, restaurants, hotels, medical facilities, shopping malls and airports. As a Growing Roots franchisee you'll also offer clients short-term rentals for conventions, meetings, corporate events, holidays and other times when a client needs to decorate for a day-long event, or for just a few days. Residential clients include people who love and want plants in their homes but don't seem to have the time to properly care for them, and those who want to "go all out" for family gatherings and holiday décor complete with Christmas trees, wreaths, ornaments, and lights. Holiday décor for commercial and residential clients has tremendous potential to be a significant part of your Growing Roots business and you may determine how in-depth you would like your holiday business to be.